I'm not sure if you know this or not but before I was an elementary pastor, I was an elementary teacher in public school. I began substitute teaching when I got out of college and then taught first grade, second grade, and music. When teaching music, I wasn't as busy because I taught the same lessons all week long. There weren't parent/teacher conferences, papers to grade, or staff meetings to attend. I had a hedgehog already but he didn't take a lot of work. He was wonderful, sweet and my whole family loved him. As great as Dan the Hedgehog was, I wanted a pet that would be glad to see me when I got home. With a job teaching music that didn't keep me as busy as teaching 1st or 2nd grade, I knew I finally would have time for a dog "teacher's pet" and Frankfurter the Wiener Dog entered into my life!! He was six weeks old and weighed two pounds when I got him! 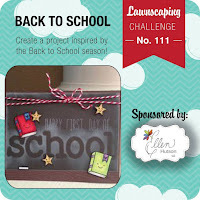 When I saw this month's Lawn Fawn Challenge was to create a project based on the "Back to School" season, I knew I had to participate because I still love teaching and the time of year when stores explode with school supplies! I thought about my card for a while and it finally occurred to me! 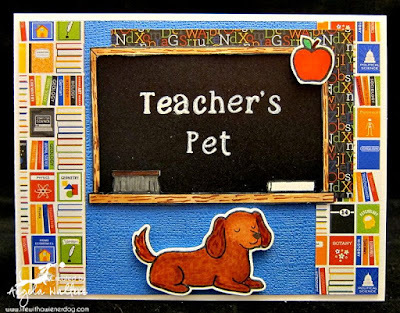 The theme would be "Teacher's Pet!" This would be perfect for my former teacher life and my current life with a wiener dog! I broke out my Lawn Fawn stamp sets and got to work! First, I stamped my chalkboard, chalk and eraser from the set "A Good Apple." Lining up the chalk and eraser with the MISTI so they sat perfectly on the frame was a breeze! I used my Copics to color the eraser, chalk and the frame of the board so it looked like wood. Then I fussy cut the inside and outside of the chalkboard out so I could add actual chalkboard paper behind the board so it looked more realistic. Then, I stamped my message using "Riley's ABCs" with white pigment ink. I didn't emboss it with embossing powder, because I wanted it to look more like chalk and less glossy. I added an apple at the top of the chalkboard because every teacher needs an apple! I stamped and die-cut my wiener dog from "Critters at the Dog Park." I colored it with Copics so it actually looked more like this teacher's pet. I added my patterned paper from Doodlebug, adhered all of my items and my card was complete. To all the teachers out there getting ready to go back to school, I hope you have a great year, great students and a pet that is as great as mine! I used a 12 x 12 Chalkboard Paper Pad from Hobby Lobby which is no longer available online. It may or may not be available in the store. So cute! My husband used to teach 9th grade History, Geography etc. when we lived in Houston. One of the kids used to say the dog ate his homework at least once a week. So, one day he actually turned in an assignment he half way did. He was already failing and he did something in class that totally disrupted everything. Mike brought it home and told me about it and I promptly called George Sydney Clyde nicknamed Bubba (Texans have big names!) over and fed it to him as he loved to shred paper if not eat it. The next day, when he handed the papers back there was just a shred left of Miguel's and Mike informed the class the dog ate it! He never used that excuse again and actually ended up getting a D instead of an F which was major for him! He became one of Mike's favorite students and the next year actually ended up with B's. Anyway, loved the card with all the fun details. Just perfect! An A+ for sure! A really sweet card Angela. 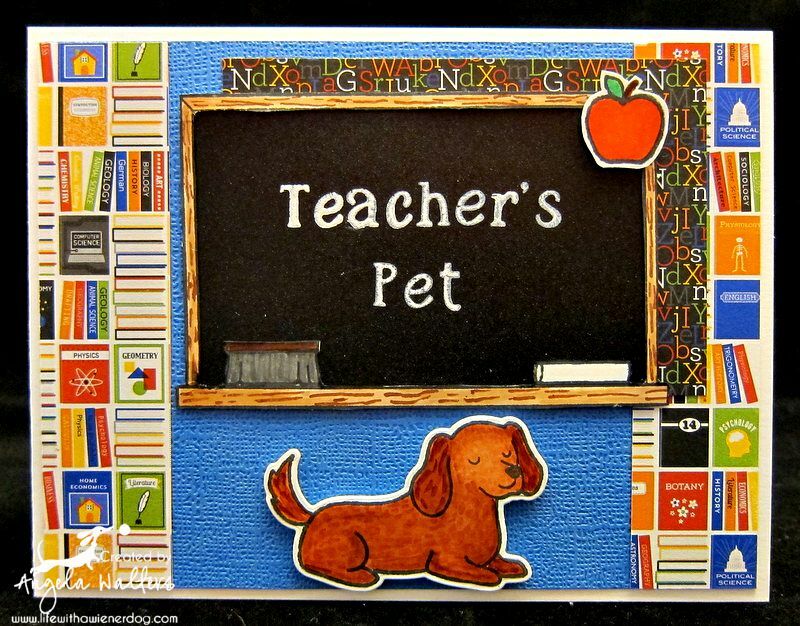 Sweet card Angela...just adorable and so perfect for back to school. I hope you are feeling better these days. Your card caught my eye over in the Lawnscaping Gallery and I wanted to come visit and see more! And what a fabulous card - love the details and it just is so cute!!! I really enjoyed visiting your blog and I would love it if you popped over for a visit to my blog at daisiesgirl.com!! I have a giveaway going on right now!